The Watchtower has promoted six different and contradictory explanations of what “this generation” refers to. Many Witnesses based their life choices on the generation doctrine that Armageddon would arrive before all those born prior to 1914 had died. Can an organization that makes such critical errors rightfully claim they alone are directed by God? There is no Scriptural reason to believe a generation referred to two overlapping groups, other than wishful thinking and a need to prop up the 1914 teaching as still relevant. Can any credence be given to this explanation? The following review of the history of contradictory generation teachings shows there can be no doubt that these teachings are neither directed by holy spirit nor Scripturally sound. A key factor to the growth of the Watchtower Society is the promise that this system will end at any moment. The shorter the expected time left, the higher the growth. (Immediately prior to dates the end was specifically expected, such as 1914, 1925 and 1975, growth increased to as high as 20 %.) When there has been no specific date set, the concept that “this generation will by no means pass away” has been used to stimulate urgency. Looking retrospectively, it is remarkable to see the number of changes to the “generation” teaching, in order to make each decade in the 1900’s appear to be the decade Armageddon would come. The commencement of Jesus’ heavenly rulership in 1914 is key to Watchtower theology, the foundation for many other teachings. Unseen and hence unproven, Witnesses expected proof in their own lifetime by means of the arrival of Armageddon – based on the generation teaching that some people born prior to 1914 would never die. When this was changed in 1995 with an article explaining that a generation could extend for multiple lifetimes, many Witnesses saw this as indication the Governing Body had lost faith, no longer confident that Armageddon is close at hand. Since 1995, the growth rate of Jehovah’s Witnesses has fallen dramatically. In 2010 the teaching changed back to say that it will be within 2 overlapping lifetimes, so it will be interesting to see if this can be used to try to turn around the declining growth rates. In what follows, each of these explanations is presented in more detail. Russell applied the generation to mankind in general – “people living contemporaneously” (Studies Vol IV p.602) He had a two way bet, explaining that the start year for the generation may have been 1780, extending for a period of 100 years to 1880, with the fulfilling of all the signs. He then went on to say it may instead refer to the 36 ½ year period from 1878 to 1914. 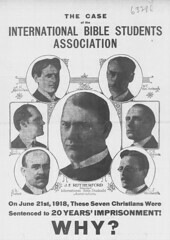 In 1927, Rutherford changed the application of the generation from mankind in general to the Anointed. Rather than a short period of time, it incorporated the entire period from the time of Jesus till Armageddon, in excess of 1900 years. In 1951, during the time of Knorr, application of the generation reverted from the anointed back to worldly people upon whom judgement would fall. The starting point of the generation now became 1914. The most important aspect of this change was that Armageddon must come within the lifetime of people alive in 1914. From 1951 to 1995 the number of years that a generation can constitute changed numerous times in an effort to make the end imminent at the time of writing. One thing remained constant; some people born prior to 1914 would live through Armageddon, never to die. In order to make it appear that in 1951 Armageddon was about to occur, the length of time for a generation was said to be 36 ½ years (37 years). With 1914 as the start date this indicated the end was due in 1951, the time of writing of the new generation concept. After 1951 drew to a close without incidence a generation was extended to be possibly up to 70 or 80 years. 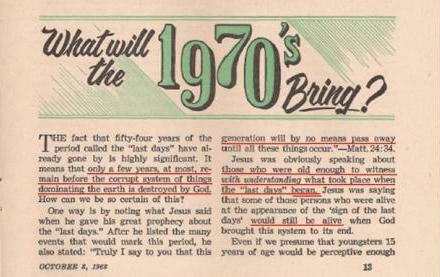 In 1968 it was said that a person as young as 15 could “discern” the beginning of the time of the end. Add 70 or 80 years to a person born in 1899 and the generation was to end in the mid 1970’s. Detailed information was provided to prove how quickly the remaining ones of the 1914 era would die out. “According to available statistics, in 1980 approximately 250,000,000 of those who were alive in 1914 were still living. That generation is not yet gone. Interestingly, however, of those born in 1900 or earlier, figures published by the United Nations indicate that only an estimated 35,316,000 were still alive in 1980. So the number drops quickly as individuals reach their seventies and eighties. When considered along with all the details of Jesus’ prophetic sign, these facts strongly indicate that the end is near.” Survival into a New Earth (1984) p.28 How Long Will the Present System Last? Christianity Today ran an article on the expectation of Jehovah’s Witnesses that the end would arrive 2nd October 1984, 70 years from Jesus enthronement. In 1984 discernment was no longer a criteria and babies started to be included in the generation, meaning that the generation were once again between 70 and 80. In 1988 an expert was used to prove a generation is 75 years. A baby born in 1914 would be 75 in 1989, leading the reader to the conclusion that the end was imminent. “J. A. Bengel states in his New Testament Word Studies: “The Hebrews . . . reckon seventy-five years as one generation, and the words, shall not pass away, intimate that the greater part of that generation [of Jesus’ day] indeed, but not the whole of it, should have passed away before all should be fulfilled.” This became true by the year 70 C.E. when Jerusalem was destroyed. Eventually the generation was given no age limit; the only proviso was that some people born in 1914 would still be alive at Armageddon. In 1993, while at Bethel, I started to wonder what would happen if the end did not come before the generation had all died. I had begun to have the inkling that the Watchtower Society was not directed by God. Here was an Organization in control of billions of dollars. Would it be given back to the members once the truth had been proven untrue? No, that could not happen. The alternative would be to adjust the teachings. Maybe Jesus invisible presence would be changed to have started at the end of the 6,000 years, in 1975. Or maybe the meaning of the generation could be changed. These were vague ideas as there seemed no need for changes for at least another decade. Other people were having similar ideas. Since 607 is an incorrect date the Watchtower could use 587 B.C.E. and start the generation at 1934. Maybe a generation would include that last person to die at the age of 120. Or, maybe the generation started in 1957 when the last sign, the space race, started. The problem with all these ideas is that sooner or later a time would pass when they could once again be proved wrong. Needless to say, despite expecting it, I was deeply affected when the teaching of a generation was changed in 1995. The Faithful and Discreet Slave had clearly seen it necessary to introduce this new teaching to prevent a mass exodus of members if the end did not appear by the early 2000’s. It was at that point that I knew that Watchtower teachings are not directed by Holy Spirit. The 1995 teaching was simple to understand, but presented in unspecific terms to hide the controversy. Put simply, the end may arrive after every person born in 1914 has died out. The people born in 1914 form a collective generation with those born in following generations. Sometime in the future this ongoing generation will see the end. This could be tomorrow but it could also be in 200 years time. Clearly this teaching had been introduced to protect the organization from the very specific, wrong teaching of the last hundred years. Rather than saying that Jehovah’s Organization or the Governing Body incorrectly promoted a wrong teaching, the 1995 Watchtower states ‘people’ made the false assumption. This allows the reader to assume that the followers misunderstood or wrongly speculated, shifting blame from the leaders that promoted the teaching. Also the term ‘speculated’ is an understatement, a more honest term would be ‘strongly emphasised’ that ‘millions now living will never die”. A third incorrect statement is that it is a ‘more precise viewpoint’. It was the opposite. It had been precisely stated that people born before 1914 would never die, now it is vaguely implied that this generation could last even hundreds of years. Further clarification of the new doctrine appeared in 1997. “In that statement, Peter was clearly not being precise as to any fixed age or length of time, nor was he tying the “generation” to any certain date. He did not say that people should get saved from the generation that was born in the same year Jesus was or the generation that was born in 29 C.E. Peter was speaking about the unbelieving Jews of that period-some perhaps being rather young, others being older-who had been exposed to Jesus’ teaching, had seen or heard of his miracles, and had not accepted him as Messiah. It must be acknowledged that we have not always taken Jesus’ words in that sense. There is a tendency for imperfect humans to want to be specific about the date when the end will come. Recall that even the apostles sought more specifics, asking: “Lord, are you restoring the kingdom to Israel at this time?”-Acts 1:6. The 1995 change was significant, as the generation teaching allowed “this generation” to extend for an unlimited period of time. The generation was still applied to worldly people, however, the time constraints were removed, so that a generation included people alive in 1914, and anyone born after 1914, up until the end came. Basically, the end could drag on indefinitely. The change was a result of necessity, but taking away a definitive time frame took away any sense of urgency and so had a detrimental affect on the growth of the organisation. The concept was senseless, as it removed any meaning from Matthew 24:34. If “generation” refers to people of an ongoing period of time, there was no point saying “this generation will by no means pass away”. For over 70 years, the Watchtower has claimed that all 144,000 Anointed rulers were chosen prior to 1935, at which time the calling was closed. Subtle as it may appear, this is of significance, as it was to pave the way for yet another generation doctrinal change in 2008. 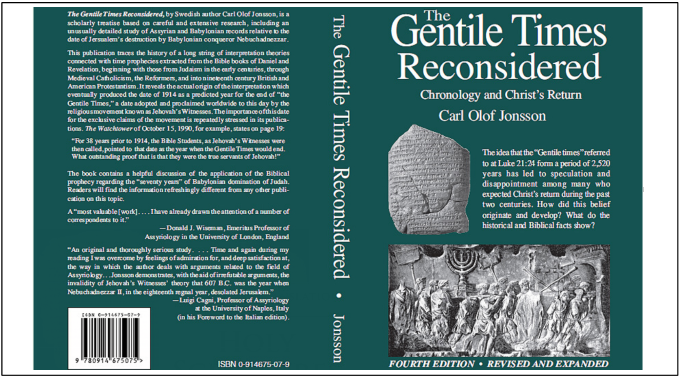 “Previously, this journal has explained that in the first century, “this generation” mentioned at Matthew 24:34 meant “the contemporaneous generation of unbelieving Jews.”* That explanation seemed reasonable because all other recorded uses that Jesus made of the term “generation” had a negative connotation, and in most cases, Jesus used a negative adjective, such as “wicked,” to describe the generation. (Matt. 12:39; 17: 17; Mark 8:38) Thus, it was felt that in the modern-day fulfillment, Jesus was referring to the wicked “generation” of unbelievers who would see both the features that would characterize “the conclusion of the system of things” (syn-te’lei-a) and the system’s end (te’/os). The generation was no longer said to refer to the unbelievers, but to Anointed believers. However, this does not bring Armageddon any closer. Since it was said that the calling of heavenly ones may not have closed, and with no suggestion for when this may occur, there was no limit to when “this generation” will die out. Interestingly, Raymond Franz showed that Schroeder had proposed applying the generation solely to the Anointed in the 1970’s. With 2008 Watchtower doctrine, “generation” could no longer be used as a limiting word; it could extend infinitum; applied to the overlapping lives of contemporaries. There are a number of reasons why the view was of dubious merit. The New Testament applies the word generation consistently to evildoers in a negative connotation, yet the Watchtower applies this term on this specific occasion to the righteous anointed. Jesus statement that the generation would “by no means pass away” applied to a group that saw both his ministry and the destruction of Jerusalem. The term generation and statement that they will “by no means pass away” have becomes all but meaningless with current Watchtower doctrine. When Jesus made this statement there were no Anointed, as the Holy Spirit was not poured out until after his death at Pentecost 33A.D. 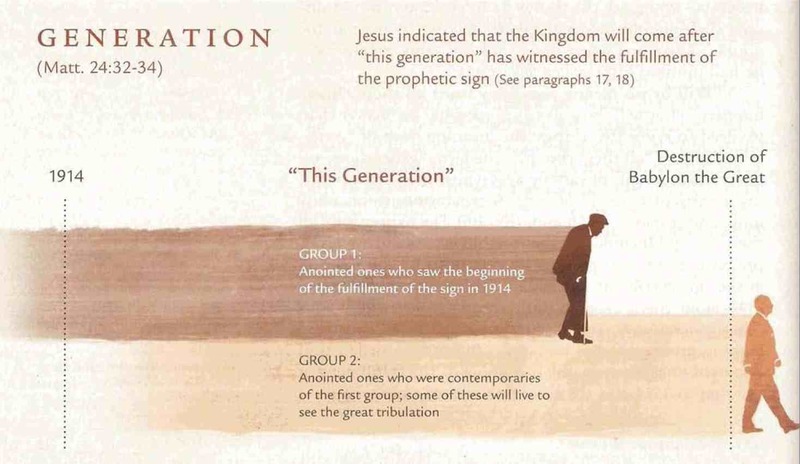 Jesus is claimed to be applying the term “this generation” to a class that at the time of the statement did not even exist. This understanding would no doubt result in further changes. It had long been illogical to claim that between 33 A.D. and 1935 there have only been 144,000 true Christians (76 a year), especially when considering there were over 50,000 memorial takers in 1935 alone. As the terminology referring to the 144,000 at Revelation 7:1-8 and 14:1-5 is almost entirely figurative, at some point in time it is likely the Watchtower will be forced to concede the 144,000 is not a literal number. In similar vein, the concept that the Great Crowd started to be gathered from 1935 becomes equally irrelevant. The Great Crowd are specifically described in Watchtower theology as people that survive Armageddon (as compared to Other Sheep that include those worshippers that die prior to Armageddon). It will not be long before the last one baptised in 1935 will have passed away, meaning that no one baptised in 1935 will be able to be considered part of the Great Crowd. In 2010, the April 15th Watchtower introduced another change to the generation doctrine in an attempt to reignite urgency. Similar to the pre-1995 teaching of a generation being a finite period of time since 1914, now it became an “overlapping” generation that can extend two life times. This is nothing more than a definition of convenience, as the important difference of an overlap has no Scriptural basis. The introduction of the 2010 Watchtower article explained that holy spirit is using the Slave to dispense increased light; ironic considering it is a contradictory merging of old light. The following is from the outline for the 2010 District Convention discussing the latest generation teaching. The 2014 book God’s Kingdom Rules! attempts to put a time limit on this overlapping generation by excluding from the generation any anointed after the death of the last one anointed before 1914. With a history of changing the generation teaching once any such time frame fails to be met, no doubt this caveat too will change in time. Since the Watchtower holds to a first fulfilment of this Scripture in the first century, it has created 3 groups – first century Christians, the 1914 anointed and the overlapping anointed alive today. The concept of an overlap is nonsense. Since there was no overlap for the first century group there is no basis that there would be today. The Watchtower tries to make the overlap concept appear valid by comparing Jesus’ words with the Old Testament example of Joseph. This is stretching the point, and few would disagree that if I talk about “my generation” it means the time I lived in. Of course, there is an overlap as some of my generation will die before I die, and some people will be born during the time I am alive, but my generation does not include a time long after everyone born the year I was born have died. After every single person born prior to 1914 has died, that generation no longer exists. The overlap generation amounts to a complete revocation of the 1995 teaching, as once more it sets a time frame, and no longer included the wicked, but rather the anointed. It is an attempt to bring back the urgency of the pre-1995 teaching, but without setting any definable end date by which to be proven incorrect. The assumption is encouraged that the end will be shortly, within in the life of an anointed that was a contemporary of an anointed alive in 1914. If Armageddon does not arrive in that timeframe, it can then be extended to an anointed who knew an anointed who knew an anointed alive in 1914 – serial overlapping. After so many revisions to this doctrine, it is farcical to claim this latest change is “advancing light” and “leadings of holy spirit.” Anyone who was deceived into thinking the 1995 explanation was truth would do well to ask themselves if they can really trust that the 2010 incarnation is any less the rantings of men. This is also the common meaning in English. 1. the entire body of individuals born and living at about the same time: the postwar generation. 2. the term of years, roughly 30 among human beings, accepted as the average period between the birth of parents and the birth of their offspring. 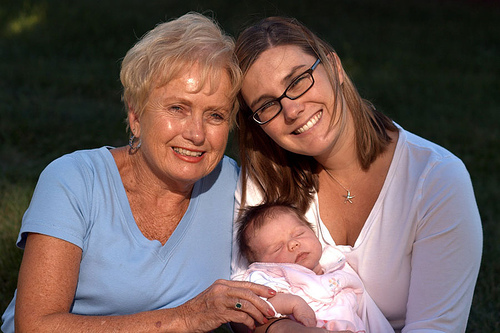 Up until introducing the 2010 concept that overlapping lifespans constitute a single generation, the Watchtower has shown that overlapping lifespans are separate generations. 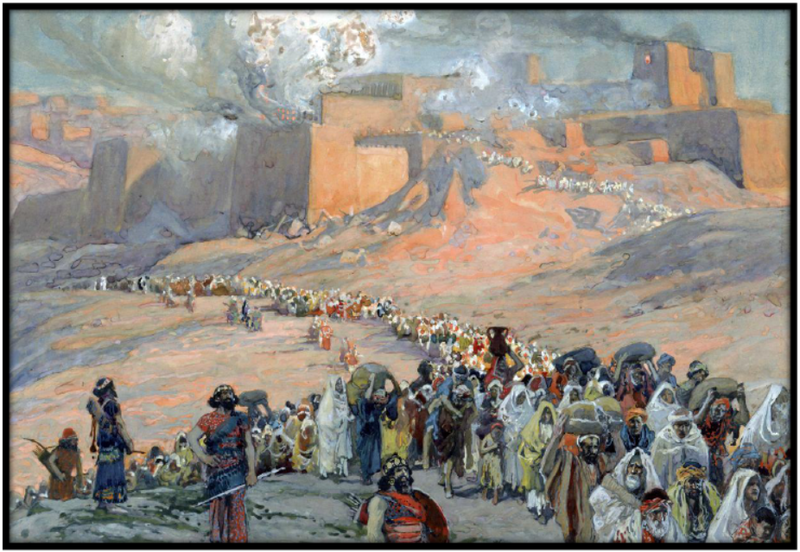 The 2010 position of a multi-century overlapping generation has only been drawn upon to manipulate its interpretation of Matthew 24. Throughout Matthew, definitions 2a (successive members of a genealogy) and 3 (the whole multitude of men living at the same time) are used. The context of Matthew 24 shows Jesus was saying the group of people living around 33 A.D. would be alive at 70 A.D. It is dubious to think Jesus had a second fulfilment for our time, and completely unsupported to say the generation will last so long it requires an overlap. A generation is generally regarded to be a group of people that live together at the same time, or about 30 years – the average period between the birth of parents and the birth of their offspring. When Jesus made his statement regarding the generation, he meant the group that saw the signs would see the destruction of Jerusalem. The Governing Body has misapplied this statement, setting false expectations for many generations of Watchtower followers. I was born in 1969 and during my life as a Witness was led to believe that I would never die. The generation teaching proved that I was unlikely to ever leave school and it was impossible that I would grow old. During primary school I prayed that the end would be fulfilled so that I would not have to go to high school. Later in my teens, I would sun bake with my cousins smeared in Johnson’s Baby Oil, laughing that we didn’t have to worry about skin cancer; we would never get that old. Witnesses are encouraged to keep a short term focus and for over 100 years Witnesses have been discouraged from having children, getting married and going to University. 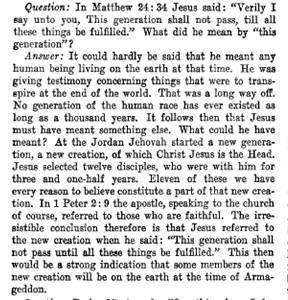 The Watchtower 1938 November 1 p.324 advised not to have children because the end was so near. Most of these followers have since passed away without the joy of rearing children and grandchildren. I was condemned by a number of Jehovah’s Witnesses for doing a university accounting degree in the late 1980’s, because “the end is so close and in the new system we will need builders, not accountants.” This short-sightedness has been encouraged by changing the generation and end teachings in the late 1800’s, the early 1900’s, the 1920’s, the 1940’s, the 1950’s, the 1960’s, the 1970’s and the 1980’s. By any logical definition, the 1914 generation is all but gone. 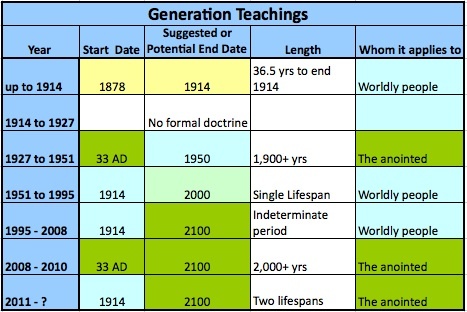 This means either the generation teaching does not have a secondary fulfilment for our day, the Watchtower doctrine about 1914 is wrong, or they are wrong on both counts. 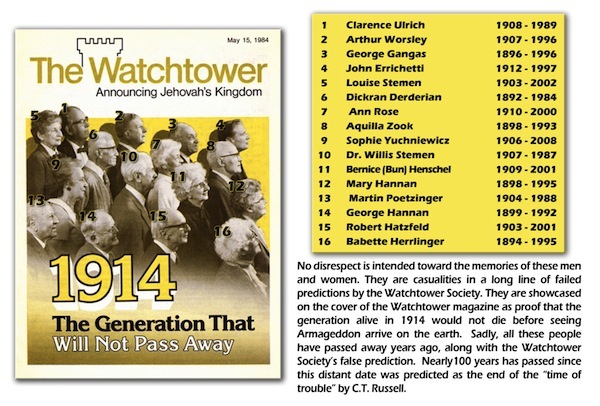 As 1914 is the fundamental doctrine of the Watchtower, it does not bide well for the Watchtower’s future interpretations. The Governing Body has alleviated proof its generation doctrine is wrong by removing any fixed time frame. But with the year 1914 quickly fading into obscure irrelevance, one must wonder when this core doctrine too will be discarded. (Mateusza 24:32-35) (…)„A od drzewa figowego jako przykładu nauczcie się tej rzeczy: Gdy tylko jego gałązka staje się miękka i wypuszcza liście, poznajecie, że blisko jest lato. 33 Podobnie też wy, gdy to wszystko ujrzycie, wiedzcie, że jest on blisko, u drzwi. 34 Zaprawdę wam mówię, że to pokolenie na pewno nie przeminie, dopóki się to wszystko nie stanie. 35 Niebo i ziemia przeminą, lecz moje słowa na pewno nie przeminą. Just as “jws” went back to the original language to discover where “Yhwh” should be in the bible,so we must do the same with “generation”. Its so easy. The word in Greek means generated,which refers to those generated by HS. Thus “born again” by HS. The “signs” are “Birth-pangs”. Birth-pangs are what happen to anointed before Gods Kingdom is Born. Christ was simply saying that all the parts of the Birth-pang signs would be completed upon those generated by HS,or those Born again by HS.